Thank you Lynn! You did a remarkable job! Amazing Amazing job! Thank you soooo much! If in the future I know anyone getting married, you are top and only in the list of my recommendations! We loved the flowers! They were perfect, all the colors we wanted, and with your guidance, they turned out better than I could have imagined. The bouquets were beautiful and I’m glad you were able to use the fabric sample on my bouquet. 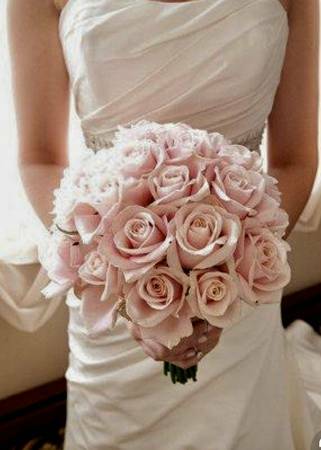 My bouquet was impressive, the roses were lovely and it had great color and shape- substantial size too. The bridesmaids’ bouquets lookes great with the dresses and complimented mine really well. Everyone loved the centerpieces- we didn’t have any trouble getting guests to take them home. We love burgundy dahlias and these dahlias were exactly what I was hoping for. So glad we came to you! I’ll send you a link when we see some pictures from our photographers. Lovely work! Thank you for the wonderful job on our wedding flowers and chair covers! The room looked beautiful, and we received many compliments on how lovely everything looked. Your idea of the purple orchids in tall vases made quite a visual impact. Even the servers kept telling us how great everything looked. The bride and bridesmaids bouquets were just perfect. I loved them, and so did my bridesmaids! I still have a couple of the bridesmaids’ bouquets in vases, although they won’t last much longer. Thanks again for your help and the fantastic job you did! I wanted to thank you and your team again for doing such a fabulous job last Saturday!!!! Everything was picture perfect! From the tables, chairs, lighting to the beautiful flower arrangements!! I would definitely recommend you to future brides!